Make each journey the next step to a new adventure. Don’t let adventure pass you by. Seize the moment, and explore the adventure you’ll remember forever whether it’s halfway across the world or right in your own backyard. The leather comes from Water Buffalo hides which have been vegetable tanned with dark walnut husks. Some adventures are planned, and others happen in the moment, but some of the best adventures are the ones that take you off the well worn paths to the unknown and unexplored. Your adventure might take you through the crags and snowy peaks of the Rocky Mountains, or you may find yourself exploring the deserts in Africa. Wherever you might be, take a path that’s a little more rugged than the rest, enjoy the mishaps and hiccups in the journey as part of the experience (except water, don’t forget to bring enough water…and warm socks). Take the moments to stand in the sunlight letting it warm your whole being and appreciate the majesty and beauty of the world around you. Sometimes, it doesn’t take that much to experience something rustic, a little old fashioned and rugged (especially when traveling washboard roads in rickety…vehicles. 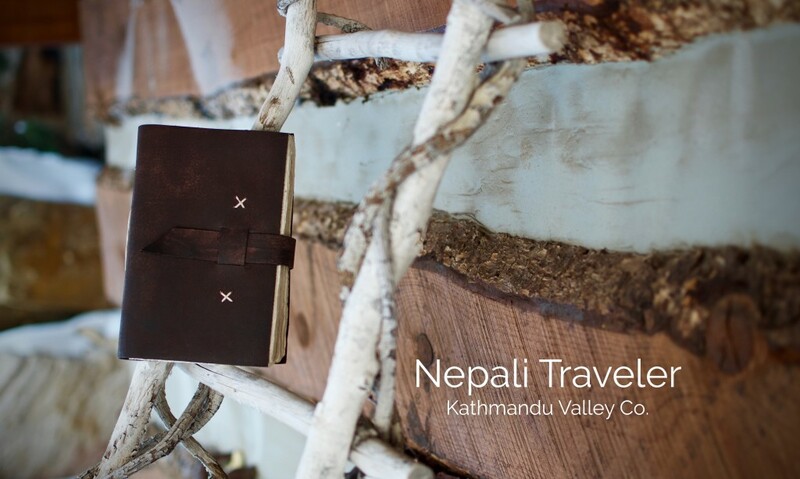 Capture the memories that you make with the Rustic Nepali Traveler Leather Journal with handmade Lokta Paper by Kathmandu Valley Co.
Pictures capture what you see. Words capture what you feel. Don’t let the feelings of the adventure slip by. Jot down the memory, no matter how small, and you may just find a deeper appreciation for the journey. Made in Nepal from cuttings of Lokta bushes, the paper is unique, textured, and full of rough edges…just like life.